I’ve been the recipient of several homeless houseplants over the past couple of years, so I’m hesitant to add too many more to my collection. But when the folks at Longfield Gardens offered me (and several other garden writers) a free amaryllis kit this fall, I was happy to give it a try, and am surprised by how truly stunning the amaryllis is turning out to be. The kit came with a whopping big bulb, a cute tin container, some soil, mulch and instructions. Back in November, the kit arrived, and I potted it up on Nov. 17. Per the instructions, I gave it a pretty thorough watering, and that was probably the last time I watered it. In a few weeks, the bloom stalk appeared and it grew so fast that I started to measure it. One day it was 11 inches, then 12-1/2, then 17. It topped out at just over 20 inches without the blooms. I was hoping the bulb would bloom in time for Christmas, but it started blooming about a week later. The bulb was located in my kitchen sink window, which is the sunniest spot I have in December, but possibly not as warm as the bulb would have liked. The blooms should last another week or so. There’s also a second stalk coming off the bulb which looks like it will bloom after this one fades. 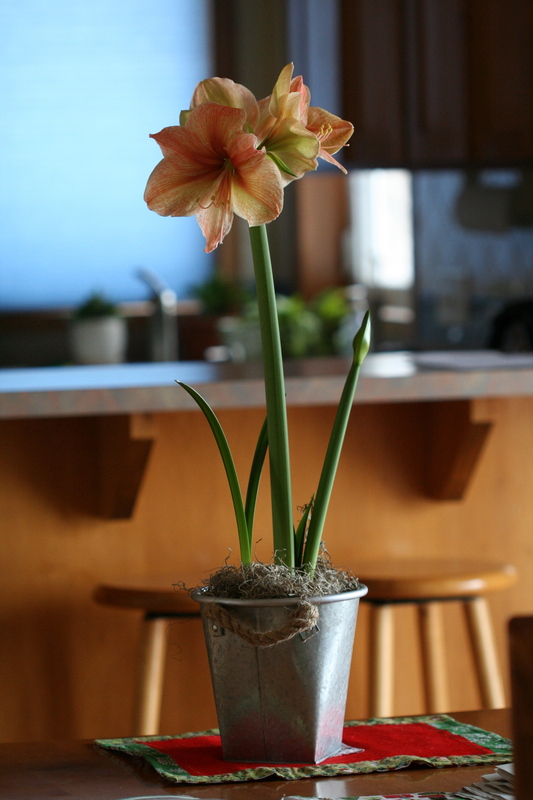 You can keep amaryllis bulbs for use the next winter. This involves removing the flower stalks and setting the bulb and its leaves in a sunny spot over the winter before moving it outside in the summer to build up the nutrition the bulb needs to bloom again. For more information about forcing bulbs, check out the November/December 2014 issue of Northern Gardener. There is a fine article by Margaret Haapoja on which bulbs to force into bloom and how to do it. I have 12 of them each on a different stage of the yearly cycle so that one blooms every month. They are stunning when in flower and I have different colors. They are pretty easy to look after and rebloom reliably. They definitely help get my gardening ‘kick’ in winter! That sounds fantastic. I will definitely be growing amaryllis again. Very pretty! 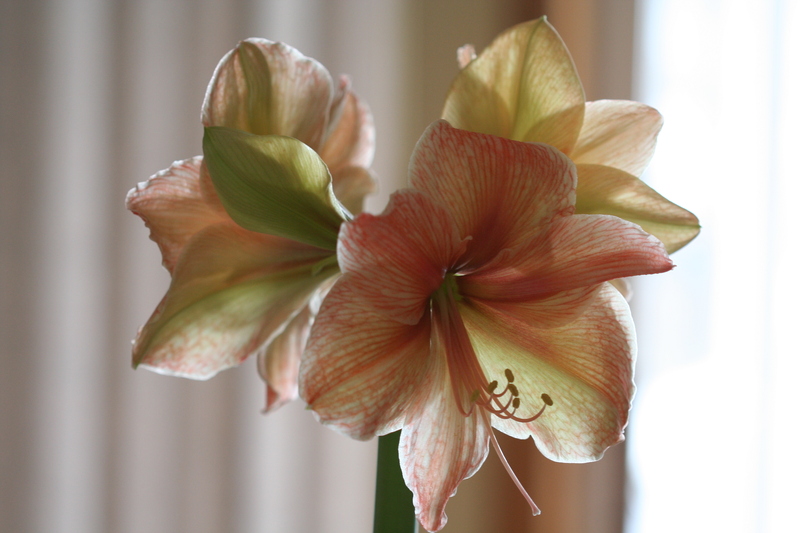 I have an amaryllis blooming away now as well. It’s nice to have something blooming in winter!